Truck drivers work long hours driving several miles in a single day. This can mean little rest during the busiest days of the year. Staying awake and properly alert throughout the entire trip is vitally important to the safety of the driver and other motorists on the road. When you stop periodically for restroom breaks, take that time to also stretch your legs. Even if it’s a brief 5-minute interval of walking or movement it can help keep your body lose and awake. Exercise keeps the body awake throughout the day and will help you sleep more soundly at night. Sure, a Red Bull or Monster will jolt you awake, but later will come a sugar crash. Stop consuming these high-calorie, unhealthy drinks! Instead, it’s advisable to turn to something like coffee for a quick energy burst as it is not full of sugar. Consuming protein will ensure that your brain is receiving the quality fuel that your brain can use to remain awake and alert. In the rare cases, you are pulling an all-night shift or longer-than-normal shift. Your brain needs a lot more fuel. About 25% of the calories in the body can be used by the brain to keep it alert during these times. Protein is it’s first choice fuel so be sure to eat plenty of chicken, fish, pork, eggs, turkey, and other lean proteins to keep your brain fueled throughout your workday. Contacts can dry out your eyes and make it harder not to squint. Therefore, it makes it harder to concentrate and focus on the road. If you know you have a tough deadline or long haul to meet, wear your glasses that day and bring rewetting drops to keep your eyes awake and alert as possible. This helps especially after dark when headlights and surrounding buildings give off harsh light. 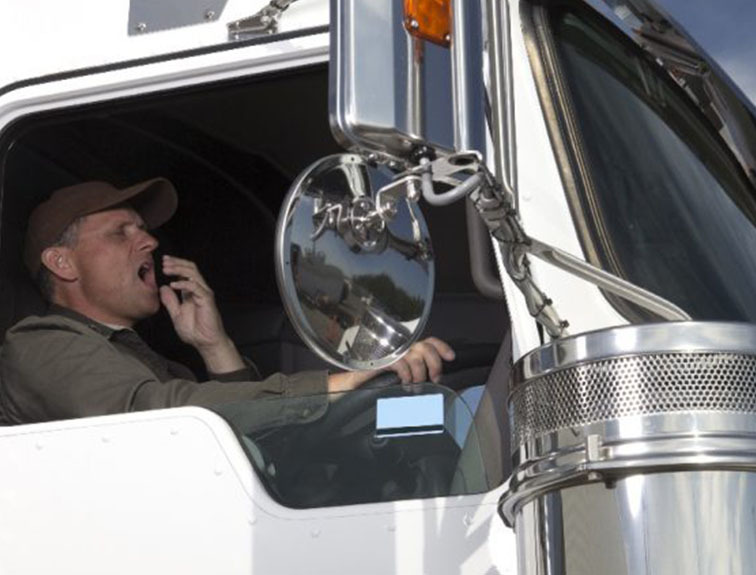 Most companies will limit the number of hours a driver may work before he/she must rest. These rules are for your safety and that of others on the road. If you are not allowed to drive more than 10, 12, or any other number of specified hours, listen to the rule. It’s not only to keep you safe but to keep others on the road safe as well. If you find yourself dozing off or drifting away while driving, keep a cold water bottle or cloth on hand that you can wipe over your face. The cold will jolt you awake, even if temporarily, to get you where you need to go more safely. Remember that being awake and alert is vital not only to your safety but the safety of others that are on the road. At Georgia Driving Academy, we do more than just CDL Training. We also make sure our students understand the importance of safety while driving. Are ready to earn your Commercia Driver’s License? Contact us today to get started!